Widely planted in gardens as well as used in parks, Gledistia triacanthos var. inermis are a very useful group of trees used as small shade trees as well as for the ornamental foliage. Many local councils widely us these as street trees with Gledistia triacanthos var. inermis which is commonly called the Honey locust, being one of the more popular species. Drought tolerant once established these are a tree that can also withstand short periods of wet soil. They grow well in urban areas and do do seem to suffer from pollution and car fumes. G. triacanthos var. inermis ‘Sunburst’ – New foliage is a yellow colour, turning to a mid to lime green. Commonly called the Golden Honey Locust and reaching around 15m in height over time. G. triacanthos var. inermis ‘ Shademaster’ – Deeper green foliage and lower growing to around 12m in height. G. triacanthos var. inermis ‘Ruby Lace’ – Smaller growing than most to around 5 – 7 m, attractive red foliage that adds contrast to the garden. Good small tree for light shade. G. triacanthos var. inermis ‘Elegantissima’ – Perhaps the smallest of all, reaching around 5m in height and suited to smaller gardens. Gledistia elegantissima is a more compact form and sometimes used as a standard. 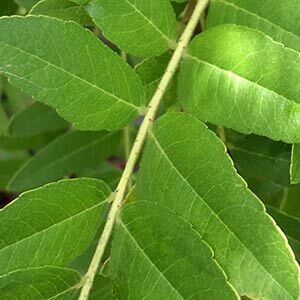 The basics of tree planting apply to Gleditsia tricanthos. Plant to the depth that the tree was in when potted, or to the soil mark on the stem if bare rooted. Plant purchased from reputable growers should be already pruned to have a good straight trunk. Ongoing pruning involves removing some of the crossover branches and multiple leaders which over time destroy the shape of the tree.